We had Mommy & Me Book Club last week and I had planned to do this craft activity with the kids, but we ended up skipping it and doing more active activities instead (it had rained all week and the kids were bundles of energy). I still think it is a simple and easy project, so we'll have to do it again sometime soon. I thought I'd share it anyway. Hopefully one of you decide to try it out with a bigger group of kids and let me know any other ways to tweak this. If you've made something like this before, please share your adaptions that are different than how I did it. 1. Cut one paper plate in half and staple the edges together to make a pocket. Cut an arch on one half of another paper plate to make a handle. Staple the handle to the little pocket to create a basket or you can just glue the handle to the pocket. 2. Tear or snip tape or colored paper to add grass to the inside of the basket. 3. 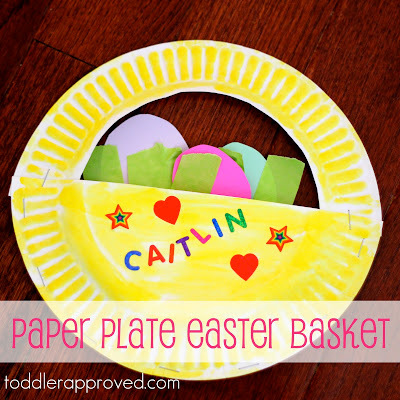 Cut or tear scraps of paper to make eggs and other items to put inside the basket. Decorate the plates with markers or paint and add stickers to personalize the basket. Once the basket is done, carry it with you while you head on over to find your favorite Easter story! For Mommy & Me Book Club this week we read There Was an Old Lady Who Swallowed a Chick by Lucille Colandro, which is our favorite silly Easter book. Do you have another activity or craft that you've done along with this book? 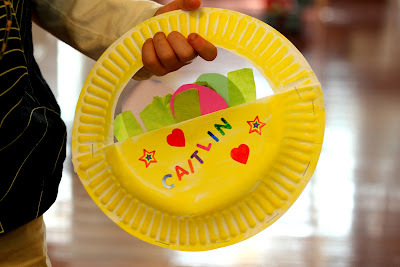 very cute and simple craft- perfect for a toddler! Oh, I like that! My daughter is a bit older, but I shared the idea with my best friend, whose son will probably LOVE it. About the books - and the virtual book club - I'm trying to start a new linkup idea, a family reading roundup, and if you're interested, would love to have you share (at http://www.ourschoolathome.com/2012/03/family-reading-roundup-hamsters-birds.html). I'm going to do it weekly, and it's VERY new - but I'm hoping to turn it into a fun way to share some new book ideas for all ages! I DIDNT USE THE STAPLES DUE TO MY KIDS ARE 2 BUT GLUING ALSO TURNED OUT PLUS HE HAD SO MUCH FUN DOING THIS CRAFT!!!! I am throwing this into our Easter list of to-dos. Our daughter will love this. Thanks.